Shemot/Exodus 8:21(25) And Pharaoh called to Moshe and to Aharon and he said, "Go, sacrifice to your god in the land." HaShem is inviting Moshe to come and talk with Him. Ibn Ezra suggests that "by now it was clear to Pharaoh that the plagues were coming because the Israelites had not sacrificed to G-d", so he tries to negotiate. Richard Elliott Friedman agrees, explaining that "Pharaoh is not fooled by the request for a 'trip of three days'. He takes a step back from his tough stance and he turns to negotiation: You can sacrifice to your G-d, but do it here in Egypt, not out in the wilderness. A process of bargaining will follow, but note that, really, all the bargaining is on Pharaoh's part. Moshe's position never changes, and in the end Pharaoh must capitulate completely." That however, does jump the gun a little, so let's rewind a bit and go back to the text. Rashi explains, "the word here means 'in your place' and do not go out to the desert." Ibn Ezra is more specific: "within his kingdom, not somewhere else". Pharaoh has not offered a bulk exit visa, or even a weekend pass. He means that the sacrifice, which he has reluctantly come to realise is necessary, should happen within his jurisdiction, inside his territory and therefore, essentially, under his control. Nahum Sarna sums up: "For the second time Pharaoh makes a concession, this time more limited - within the land, not in the wilderness." Pharaoh has sweet-talked Moshe and Aharon into coming to see him and offered a deal. But this concession is really no concession at all, because it still leaves the Israelites in Egypt and Pharaoh in control. It is instructive to see what happens next. How does Moshe respond? "But Moshe replied, 'It would not be right to do this, for what we sacrifice to the L-RD our G-d is untouchable to the Egyptians. If we sacrifice that which is untouchable to the Egyptians before their very eyes, will they not stone us! So we must go a distance of three days into the wilderness and sacrifice to the L-RD our G-d as He may command us'" (Shemot 8:22-23, JPS). Completely unfazed, Moshe politely but firmly re-iterates his original demand together with irrefutable logic: the animals they are to sacrifice are regarded as a divine symbol by the Egyptians - at least two of the Egyptian gods are depicted with human bodies and a ram's head - so this would cause a religious riot if done within Egypt. Pharaoh backs down a little more: "Pharaoh said, 'I will let you go to sacrifice to the L-RD your G-d in the wilderness; but do not go very far" (v. 24, JPS). But he still has a long way to go. We can learn lessons from both sides in this struggle. From Pharaoh we can learn the futility of arguing with G-d or trying to negotiate our way out of what we have been told to do. From the very beginning of the piece - when Pharaoh arrogantly says, "Just who is HaShem anyway? Never heard of Him. I don't know Him and have no intention of having Him tell me what to do!" (Shemot 5:2, paraphrase) - Pharaoh switches between alternate phases of bluster and retreat, trying to give as little ground as possible in spite of being up against overwhelming power. His prestige, his reputation, his self-respect, his position in Egypt as a god, or at least a son of the gods, are all on the line; this is a public humiliation and systematic reduction of Pharaoh, the Egyptian pagan religious system and Egypt's position as the superpower in the region, to nothing. If it hadn't been for G-d's assertion to Moshe that, "I know that the king of Egypt will not let you leave unless he is forced to do so. But I will reach out my hand and strike Egypt with all my wonders that I will do there. After that, he will let you go'" (3:19-20, CJB), it might be interesting to speculate what might have happened if Pharaoh had had the humility to agree to the Israelite departure when he was first asked. Are we ever in the position of Pharaoh? Does G-d ask us to do things, to humble ourselves before Him and simply obey Him? And are we always willing to do that? 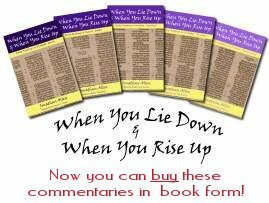 Many Christian testimony books have been written recounting the individual struggles that people have faced, trying to bargain G-d down or avoid doing something that they don't want to do - perhaps by offering an alternative, something less painful or costly for them - until they give in and submit to G-d. The prophet Jonah simply ran away: "Jonah got up and went in the opposite direction to get away from the L-RD. He went down to the port of Joppa, where he found a ship leaving for Tarshish. He bought a ticket and went on board, hoping to escape from the L-RD by sailing to Tarshish" (Jonah 1:3, NLT). From Pharaoh we can learn the lesson of doing what G-d says, of obeying His word, of acceding to the nudge of His Spirit - and, yes, you know when you are being talked to - first time around without trying to wriggle. Of course we need to be sure that we have heard correctly, but there are ways of doing that without rebelling against the instructions. G-d doesn't mind open, honest questions to confirm or clarify what He is saying; He doesn't take kindly to prevarication, evasion or stubbornness, let alone arrogance or outright rebellion. He is going to win and we need to obey quickly and joyfully, knowing that what He asks is for our own good in the end. From Moshe, on the other hand, we can learn about holding out for what we know is right and for what we have been told to do. Moshe knew what he heard G-d say: "I will send you to Pharaoh, and you shall free My people, the Israelites, from Egypt ... I will be with you; that shall be your sign that it was I who sent you. And when you have freed the people from Egypt, you shall worship G-d at this mountain" (Shemot 3:10-12, JPS). He knew perfectly well that nothing less than the complete emancipation and release of the Israelites from Egypt was G-d's desire and plan. No coming back after three days; no turning a blind eye to holding a worship party in someone's garage out of town where hopefully no-one would hear or notice; no mere release from slavery but staying on as contractors. When offered a deal - any deal, but this one fell well short of the target - Moshe simply restated the original demand, because G-d hadn't changed His mind and had never intended to change His mind. The immediate result is that Pharaoh backs down and offers more ground; not enough, of course, but ground. It would all come in time. Moshe simply had to wait and see Pharaoh crumple and capitulate. Are we ever in the position of Moshe? Do we know what G-d wants us to do, the size and scale of the project that He has in mind? And do we settle for second best? Do we let the world or, even worse, the church - and yes, we've all been there and done that - talk us out of what G-d has actually asked us to do and settle for something less, something smaller and less inconvenient, less risky? Do we accept a half-measure, even though we know it isn't what we were told to do, because it comes without too much of a fight rather than holding out for what we know is right even if it means taking some heat? What matters is that G-d's will is done, that His name is honoured, that His plans are not watered down, diluted or frustrated. As Rav Sha'ul told us: "For though we walk in the flesh, we do not war according to the flesh, for the weapons of our warfare are not of the flesh, but divinely powerful for the destruction of fortresses. We are destroying speculations and every lofty thing raised up against the knowledge of G-d, and we are taking every thought captive to the obedience of Messiah, and we are ready to punish all disobedience, whenever your obedience is complete" (2 Corinthians 10:3-6, NASB). Our job is simply to be there and allow the L-rd to work through us, so that He can do what He wants. He has given us everything we need - and more - to accomplish the task of bringing everything under the authority of His Son. We dare not settle for less! Application: Are you a bold warrior, fighting for the kingdom of G-d, or are you a shrinking violet, avoiding conflict and praying for peaceful resolution? Yeshua told the disciples, "I am sending you out like sheep among wolves. Therefore be as shrewd as snakes and as innocent as doves" (Matthew 10:16, NIV); both qualities are required. Sometimes we simply cannot accept compromise - G-d has spoken. Is today your day to be bold and strong and see what G-d will do?